Nothing could have been more satisfying than watching my Screwer In The Rye Lager begin to fill the beer line as it made its way from the picnic tap to my favorite beer glass. What a huge improvement this pour had going for it, compared to the wildly foaming pours of two weeks ago. This time there was absolutely no foam at all in the beer line whatsoever and each pour was perfectly carbonated. Anxious to bring beer to a party, to share with friends and family for the first time, I had connected the corny keg's beer out to a picnic tap using a 5 foot length of 3/16" id vinyl tubing that I bought at a local Ace Hardware store. So with my latest beer toys in hand, a serving dispenser that uses 16 gram Co2 cartridges and an insulated corny keg sleeve with freezer gel packs, I took to the road. As cool as my new mobile beer delivery system was, it was soon evident that the pours were turning out to be anything but spectacular. For some unknown reason at the time, every glass of beer we poured just foamed over like mad. We made the best of the foaming situation having fun trying to come up with ways to pour the beer without getting all foam in our glass. What I did differently this time around was change the force carbonation method to set and forget and I couldn't be happier with the results. The previous time I had cranked the gauge to 30 psi and gassed the 36F beer in the corny keg for a little over 48 hours, which had over carbonated the beer to the point where it was impossible to get a good pour. The sweet spot for my setup actually turned out to be 10-12 psi, with the beer chilled to 36F for 5 to 7 days, this resulted in both perfect pours with carbonation and no wild foaming! 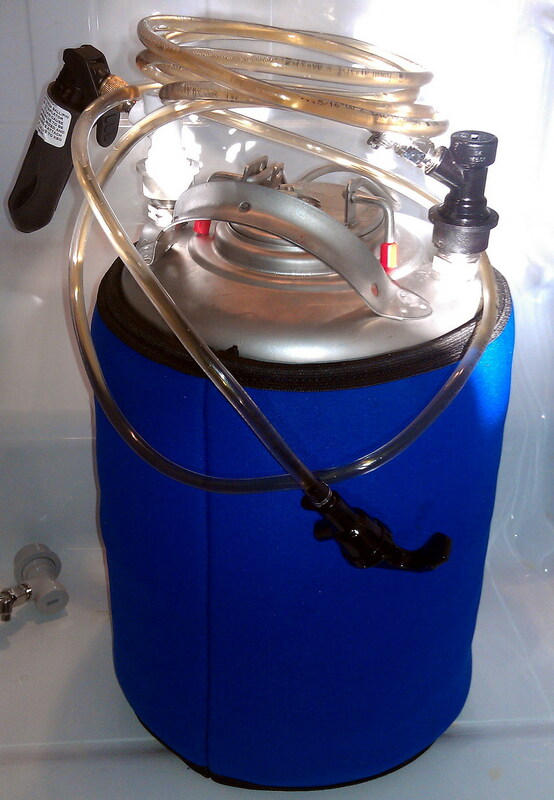 There are also some less obvious, but just as important benefits, to using set and forget like no more venting Co2 from the corny keg to serve your beer at a lower psi to prevent foaming, and releasing all that great beer aroma in the process. The system is also balanced so that the carbonating pressure is the same as the serving pressure, each foot of 3/16" id vinyl tubing adds 2 psi of restriction, using a 5 foot length adds 10 psi to balance things out just right. As time goes on I'll be tinkering with the length of tubing used with a picnic tap, some folks have claimed all that's needed is a foot or so to get a good pour. Preparing for kegging begins about 5 days ahead of time, that's when I put my fermentor in the refrigerator for a nice long cold crash. 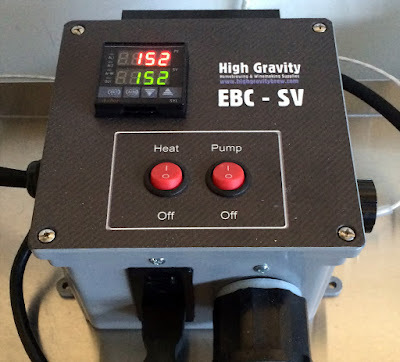 During this time the cold temperature helps to clear the beer, as the yeast and other particles drop out of solution. After 5 days in the refrigerator I transfer the cold beer into the corny kegs and put them back into the refrigerator with the Co2 gauge set to 10-12 psi for up to 7 days. 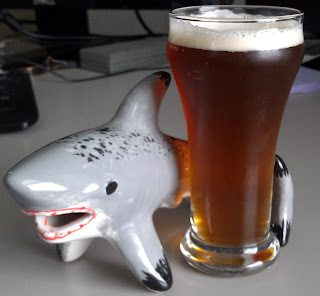 Today I'll be enjoying some fresh Screwer In The Rye Lager on tap as I brew up another batch of my Bottoms Up Brown Ale, knowing that I've finally mastered the art of the pour. I have a three keg system (kegerator), I found that if you leave the pressure on from the tank you are guaranteed to get foamy pours. I always disconnect the other gas lines when I force a beer. I too keep it around 10 psi, but I charge the system and then turn off the tank. After a few days I pull a taste, and see if it's getting carbonated. I keep doing this until I get the level of head I'm looking for, recharging the keg as needed. Once I'm satisfied I add the other gas lines, charge those tanks and back off the tank. I actually have a ip camera pointed on my regulator, I also found keeping the tank in the fridge is a bad idea. The cold messes with the gas in the tank, I actually think I lost gas that way. Another option is to add 1/4 priming sugar before you keg, that way you can jumpstart the process before you put your keg under the bottle. Adding the whole thing, foam pours and no need for gas. It's been averaging about 40-45F in my garage where I keep my refrigerator with the beer tap in the side. Now that all my Co2 lines are tight and there's no gas leaks I've just been setting the gauge to 13-15 psi and leaving the valve open for about a week. 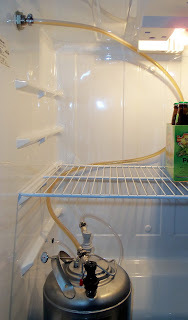 Once a day I'll connect that gas line to another keg, if I happen to have more than one keg filled with beer, to give it some more pressure too and then return the line to the first keg I plan to tap. This gives me a good level of carbonation and pours foam free using five feet of 3/16 id vinyl tubing. When I hook the same keg up to my Perl tap using 5/16 id vinyl tubing I have to back the gauge down to 4-6 psi so the glass doesn't fill too fast. It's all pretty cool.